Chavín: 1000 B.C. – 200 A.D. The Chavin culture began its development at the ceremonial center of Chavin de Huántar in the mountain range found within the province of Ancash. Chavin is one of the most important antique cultures of the pre-Inka past and is based in agriculture and the development of textiles, pottery, metallurgy, and works of stone; the culture is considered to be the matrix of the Andean civilization. The centers were organized under an elite theocratic system that controlled the cult, including the exchange of products with other areas. In the case of Chavin de Huántar, the center contains a Gallery of Offerings where the remains of lucrative objects can be found – objects such as: stone remains, decorated ceramic items, and the remains of animals from distinct Andean regions. The members of the elite system are distinguished by the usage of crowns, ear-muffs, nose-rings, and necklaces – elements that represented the type of people of those who used those items (called the felinico cult); this cult was visual – the feline god (possibly a jaguar) was placed in terrifying images that represented complex beliefs and that also linked humanity with animals and the members of distinct groups. Every ceremonial center had its proper divinity but shared some elements with the other temples due to the fact that the principal eagerness of this agricultural culture was the control of water and land fertility. Wari: 600 A.D. – 1100 A.D. The Wari culture was developed around the end of the Middle Horizon period in the area of Ayacucho, where a tradition of urban centers started to form that are linked to the Nazca culture; this culture started its expansion in the North, South, and West – and, in a little bit of covered time, central Perú was under the dominion of Wari. The city of Wari had been developed as an important center, and the buildings were surrounded by walled enclosures with interior buildings of two or three floors. This city had a capacity of approximately 70-million people even though it is believed that population never surpassed more than 21-million inhabitants; half of the city was utilized for residence – and, the other half was utilized for administrative and religious functions. The Waris were miltant conquerors who constructed and maintained important military posts within Peruvian territory, and some of those posts were: Piquillacta – close to Cuzco, Cajamarquila – close to Lima, and Wilkawain – close to Huaráz. The Imperial Inka Empire acquired one of the principal pre-Hispanic civilizations of America in virtue of a grand territorial scale, as well as a grand number of the population that had been dominated by the same; the empire emerged within the 12th Century after the collapse of Tiwanaku. 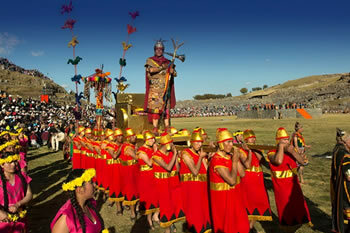 The principal Inka people are legendary – especially the figure of Manco Capac who is immersed in the legend. The expansion of the Cuzcan manner has place from what is called Viracocha – the 8th Inka; this expansion was made effective by Pachacutec who entered during the historical chronological period and also of a period of specific works. This monarch was succeeded by Tupac Inca Yupanqui, Huayna Capac, Huascar and Atahuallpa. Even though its duration was short, it consolidated a socio-political act that integrated multiple villages and domestic units of heterogenic ecological zones. The vastness of the empire extended from the North of Ecuador to the center of Chile – that which occupied the mountain range of Ecuador and Perú, the highlands of Bolivia, and the Northeast of Argentina. The Spanish Conquest truncated in 1532 – a development by which it is difficult to imagine its future possible stages. When the Imperial Inka Empire wasn´t even at full maturity and was debilitated by a civil between Huáscar and Atahuallpa, Spanish colonization had a place – it started in 1531 after various attempts when Pizarro, a commandant of 180 men, decided to start an encounter with the Inka emperor in Cajamarca; Atahuallpa – the Inka emperor – had assumed power and was in the middle of a civil war with Huáscar, his half brother, when Pizarro took advantage of the situation. After capturing Atahuallpa, he put in place a mandate with the purpose of putting Huáscar to death; Huáscar offered a great quantity of silver and gold for his freedom, but – after accepting the offer - Pizarro still condemned him to death in 1533. The same year, the Spanish seized the Imperial Inka Empire. Pizarro founded the city of Lima on January 6, 1535 – the same day as the celebration called Reyes Magos; it is for this reason that Lima is known as “the City of the Kings” (Ciudad de los Reyes in Spanish). Lima was converted into the capital of the Virreinato del Perú in 1543 and also was one of the principal cities of the Spanish Empire. The University of San Marcos was established – one of the first universities of the continent; also, silver and gold were the most important means of economic profit in Spanish colonization. The creation of the Virreinato de Nueva Granada in 1739 separated the authority of Lima in the area which is now known as Panama, Colombia, and Ecuador. The establishment of the Virreinato del Río in 1776 decreased governed territory from Lima during this time; a great indigenous revolt was actuated by Túpac Amaru II that lasted from 1780 to 1783 and was suppressed violently by the Spanish. 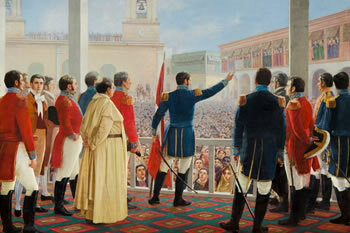 “PERÚ – FROM THIS MOMENT – IS FREE AND INDEPENDENT BY THE GENERAL WILL OF ITS VILLAGES AND BY THE JUSTIFICATION OF ITS CAUSE THAT IS DEFENDED AND UPHELD BY GOD.